A Victorian Alphabet: Y is for Why Yellow?? Charlotte Perkins Gilman’s The Yellow Wallpaper (1892) is a staple nineteenth-century text for students of literature in the English-speaking world, and especially the US. The 6,000-word short story is an account written in the first person of a woman, Jane, who has been confined to an upper room in a secluded house by her husband John as a result of a nervous disorder. There, having been prescribed a ‘rest cure’ for her hysteria, separated from her baby, and barred from writing, she goes slowly mad, convinced there is something living behind the room’s yellow wallpaper. Even this straightforward summary raises lots of questions (and contains plenty of content for future blog posts! ), but one central question stood out to me the first time I read the text (and seems to have occurred to multiple other students turning to Yahoo Answers for clarity!) – why is the wallpaper yellow, rather than any other shade? The colour is repellent, almost revolting; a smouldering unclean yellow, strangely faded by the slow-turning sunlight. It is a dull yet lurid orange in some places, a sickly sulphur tint in others. Two important and recurrent associations with yellow are noticeable – yellow is the colour of putrification and also of a milder kind of fading, caused by the passage of time. I saw that everything within my view which ought to be white, had been white long ago, and had lost its lustre and was faded and yellow. The only thing I can think of that it is like is the COLOUR of the paper! A yellow smell. In doing so, she is not merely exhibiting an increasing monomania with the paper. ‘Jane’, isolated though she is, is acting just like many other writers of the 1890s! For many (especially European) writers of the Fin de Siècle, yellow was the defining colour of the period, with its associations with degeneracy, the wasting away of the age, a sickliness brought on by inbreeding, boredom or excess. There was a practical link too. In the nineteenth-century, scandalous French novels were bound in yellow paper to warn browsers of their racy contents. It is one of these books which helps to corrupt the impressionable Dorian Gray in Oscar Wilde’s The Picture of Dorian Gray, published the year before Gilman’s story. It is stripped off—the paper—in great patches all around the head of my bed, about as far as I can reach, and in a great place on the other side of the room low down. But it is interesting to note that Dorian’s book is not generic. It has a particular model as Wilde’s description of it makes clear. It is À Rebours (1884), by Joris-Karl Huysmans (which I reviewed on this blog in September 2013), a novel which is the quintessential story of the degenerate (French) life. It was the strangest book that he had ever read. It seemed to him that in exquisite raiment, and to the delicate sound of flutes, the sins of the world were passing in dumb show before him. Things that he had dimly dreamed of were suddenly made real to him. Things of which he had never dreamed were gradually revealed. Dorian’s feelings of discovery and revelation here before a later fall match perfectly with the early stages of Jane’s fixation with the yellow wallpaper. The novel and the paper feel incomplete, raiments, something torn, but they inspire what could be described as creativity – Jane’s writing, Dorian’s beautiful life – but could also be identified as self-destructive madness. 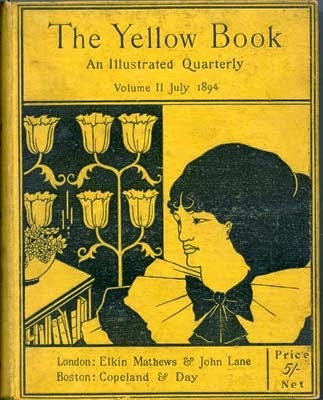 When it came to naming a quarterly literary journal in London in 1894, its founders were in no doubt what to name it – The Yellow Book was the perfect descriptor of the age although it (fittingly!) died out before the end of the century (1897). With contributors including Aubrey Beardsley, Max Beerbohm, H.G. Wells and Henry James, The Yellow Book shows just how much yellowness meant to writers of this period. We’re nearly there! What should be 'Z' in my Victorian Alphabet?? It’s a tricky one so send me your suggestions – here, on Facebook, on Google+, or by tweeting @SVictorianist! Some texts have an afterlife which is entirely reflective of the spirit in which they were written. One of these is Henri Murger’s Scènes de la Vie de Bohème (1851). 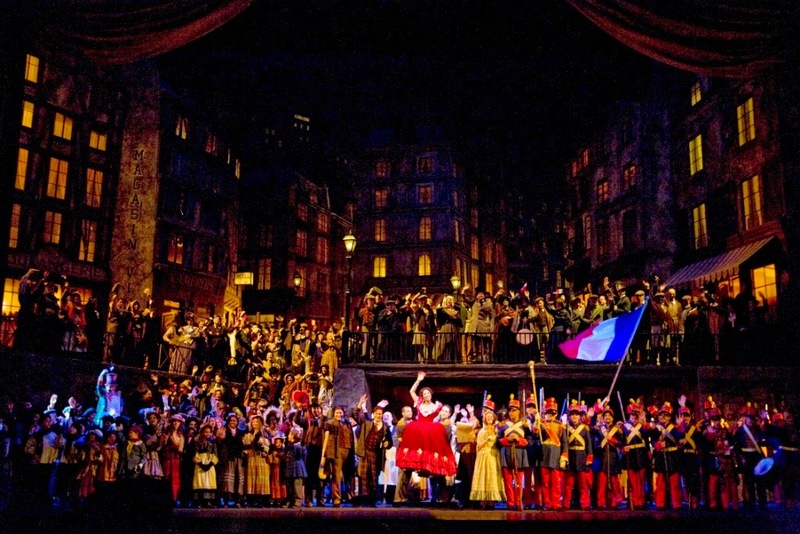 The other week I attended the New York Metropolitan Opera’s wonderful production of Puccini’s La Bohème, the world’s most popular opera, which premiered in 1896 in Turin. In preparation for the performance I decided to read Murger’s work (on which the libretto by Luigi Illica and Giuseppe Giacosa was based), even though every programme blurb is likely to tell you the adaptation is ‘loose’ at most. Murger’s ‘novel’, which I read in translation, is more of a series of short stories set in Paris’ Latin Quarter. Characters recur, some with greater frequency than others, but timing is more nebulous and the plot hard to define. In the opera, Rodolph and Mimi’s relationship – its inception and conclusion – bookends the story. It is important in Murger too, but not central, and many of the features of Mimi’s story in the libretto (e.g. her profession and her death) are taken from an additional and minor character in the novel – Francine. This is interesting. It suggests a dichotomisation of women in the opera – timid, initially chaste Mimi contrasted with worldly Musette – which is not the case in the text, where if anything the resourceful women trading on their beauty seem more sensible than their permanently broke and utterly deluded lovers. The stage world of great loves and tragedy is instead a constant comedy of bed-hopping and betrayal, where death is a constant feature, but life most always go on. Rather than plot, what was lovely to see brought to life in the opera were details of the Bohemian life, which come up again and again while reading Murger’s vignettes. There is the cold, furniture sacrificed to open fires, near-continual drunkenness, tenants eluding the landlord, and strong emphasis on (male) friendship - which is more central than romantic love in the original. This production did a great job of transporting the audience to Paris – whether the city’s bustling streets, or a quiet garret, set against a darkening skyline. When the curtain falls you’re suddenly back in New York, bereft of the idiosyncratic Bohemian life of the Latin Quarter. Finishing the novel is a similar experience. Characters and a way of life, with which a succession of stories has made you oddly familiar, fade away. If nineteenth-century Paris were a destination I could choose to visit, I’d have no hesitation in heading back for more. Do you know of any other NYC events with a nineteenth-century link the Secret Victorianist could attend? Let me know – here, on Facebook, on Google+, or by tweeting @SVictorianist! Yesterday, I visited the Metropolitan Museum of Art here in New York to see two very different exhibitions of a nineteenth-century flavour. Madame Cézanne, which runs until 15th March 2015, brings together 24 of the 29 known paintings by Paul Cézanne of his wife Hortense Fiquet, along with additional sketches and watercolours. The paintings cover more than 20 years (from the 1870s-1890s) and simultaneously give a wonderful glimpse into the artist’s techniques and his private life. Cézanne’s ready access to his subject meant he had an opportunity for many variations on a theme – most obviously the four ‘red dress’ portraits, including one from the Met’s permanent collection, (which date from 1888-1890) which see Hortense in the same garment, but posed slightly differently against varying backgrounds, as the painter experiments with different combinations of colour and compositions. The sitter can at times appear as formal an element as a tree branch or pot plant, her expressions enigmatic, at times even indistinct. Yet the sketches suggest a very different story – one of an intimate and happy family life. 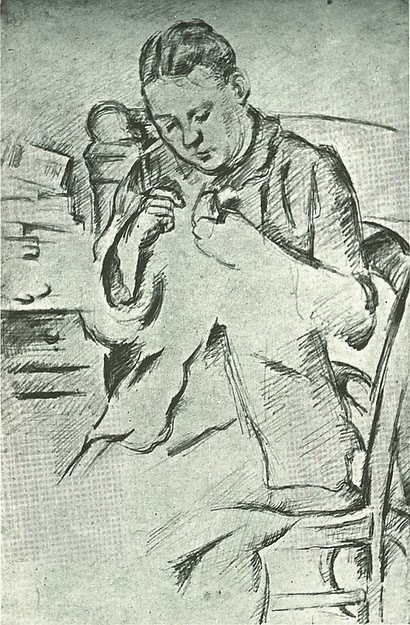 Here is Hortense bent over her needlework, her sleeping head upon a pillow, their baby Paul fils feeding from her breast. This is hard to reconcile with what we know of Cézanne’s marriage – the hostility of his friends towards Hortense, the secrecy of the relationship for 17 years, as the artist feared his family’s disapproval, their late marriage (in 1886). 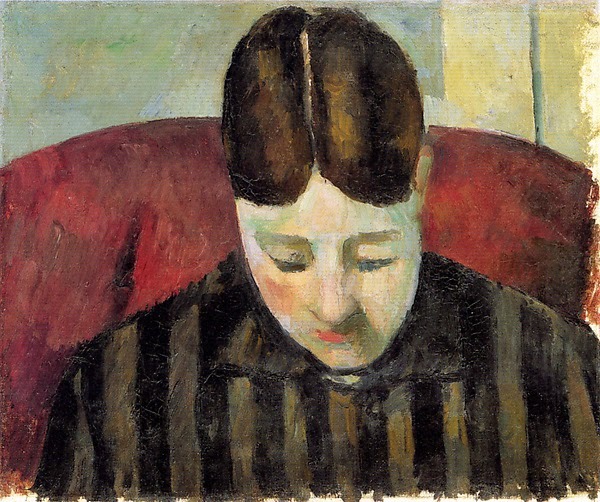 You need only read the Wikipedia entry dedicated to her to see how Hortense’s failures as a wife and negative impact on her husband’s art have passed into the commonly accepted history of the artist’s life. 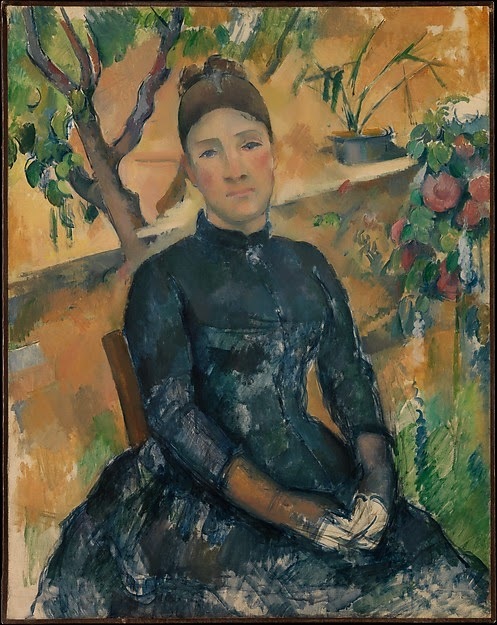 What this exhibition offers, if not exactly a rehabilitation of Hortense’s public image, is an opportunity to re-examine this relationship (one marked by the social and financial inequality common to many marriages in the period), along with some of Cézanne’s most wonderful paintings. Visit if you can! 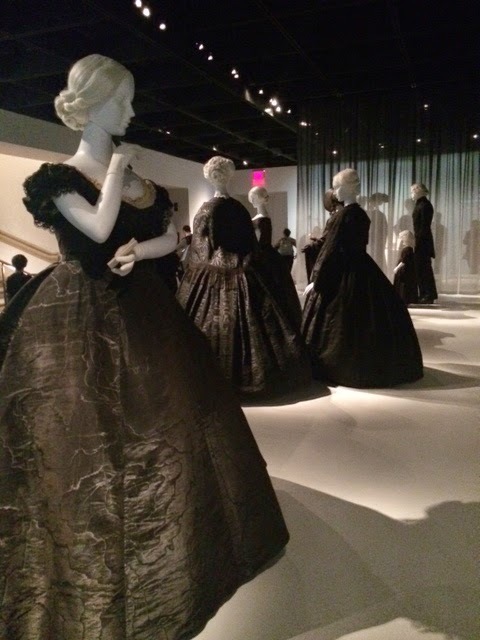 Death Becomes Her, on the other hand, which runs until 1st February 2015 in the Anna Wintour Costume Institute at the museum, is an exhibition of nineteenth-century American and European mourning (largely women’s) fashion. Having visited, and blogged about, The Art of Mourning exhibition at Brooklyn’s Morbid Anatomy Museum a few months ago, which included examples of Victorian post-mortem photography and portraiture and hair-work, it was wonderful to see such fine examples of the clothes which would have been worn by the mourners in the period, who were participating in these other acts of memorialisation. 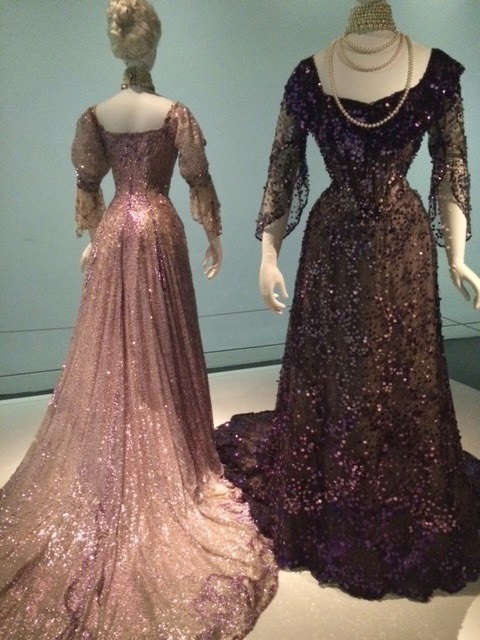 Spanning the entire century, and the very early 1900s, the dresses on display here ranged from the simple, to the extravagant – from afternoon and walking dresses, to those suitable for a ball or even a wedding. 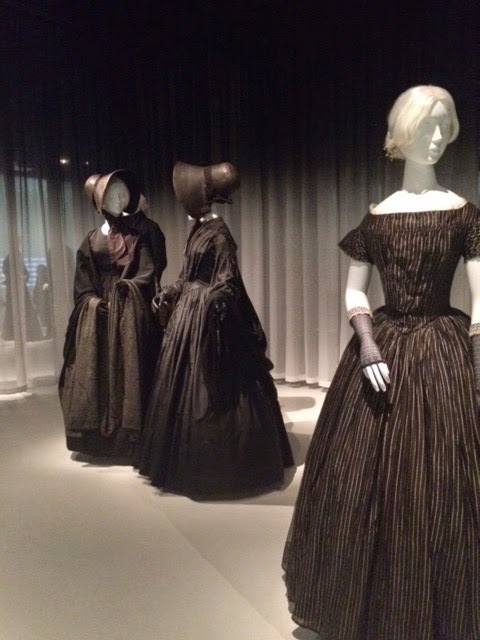 The exhibition does a good job of explaining the etiquette around mourning in the period, the influence of fashion plates (some of which are on display here and the criticism women could be subjected to for failing to display an ‘appropriate’ level of grief. It also touches – briefly – on the highly interesting subject of the position of the widow in nineteenth-century culture. 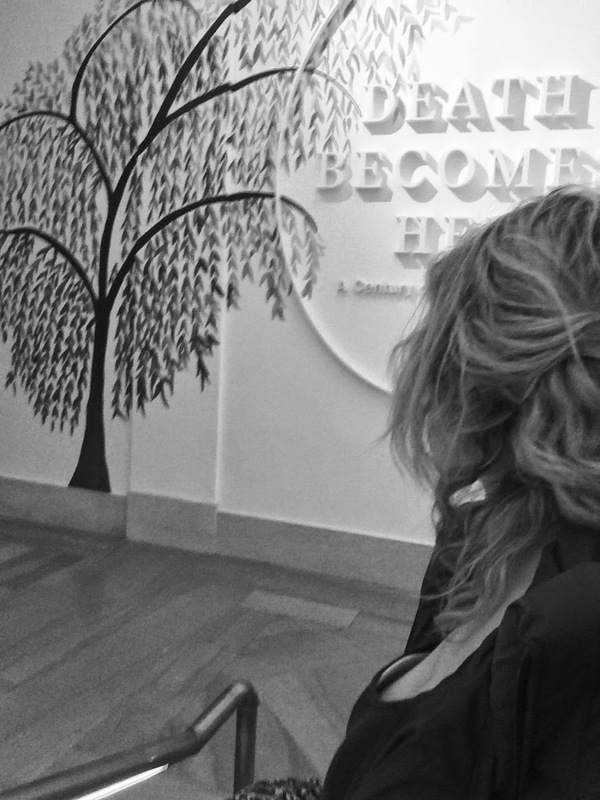 Available for marriage, but, unlike most girls, financially independent and sexually experienced, the widow, despite being subjected to the most demanding strictures around the displays of mourning, cuts a socially disruptive figure. A side room at the exhibition houses a series of satirical drawings, entitled ‘A Widow and Her Friends’, by Charles Dana Gibson which ran in LIFE magazine in 1900, which takes a humorous look at this very issue. As ever, with displays of nineteenth-century fashion, the diminutive proportions of the clothes and, especially, the miniscule waistlines are particularly striking, with a dress worn by Queen Victoria herself being a notable exception! Steer clear if the sound of a darkened room with requiems blasting from the speakers isn’t your idea of fun, but otherwise this is a beautiful, fascinating, and well-curated exhibition. The Met has a recommended (i.e. optional!) admission of fee of $25 – entrance to special exhibitions is at no additional cost. Find out more about visiting here. Do you know of any other New York exhibitions with a nineteenth-century focus the Secret Victorianist should visit? Let me know – here, on Facebook, on Google+ or by tweeting @SVictorianist. A novel concerned with the intricacies of the social milieu in 1870s Washington D.C. might not cross your mind as being the first place to look for an exploration of modern democracy and a cracking portrayal of political and personal intrigue. Yet there is so much in Henry Adams’ 1880 Democracy which resonates with modern concerns about the pursuit of power, the nature of governance and corruption of the political elite that it could easily be reimagined as a twenty-first century political drama. Young New York widow Madeleine Lee heads to the heart of American democracy to discover ‘the gold of life’ she finds lacking in the philanthropy and philosophy with which she currently fills her days. Clever and attractive, with younger, less politically-minded sister in tow, what Madeleine finds there instead is Silas Ratcliffe, the Senator from Illinois, a man without moral scruples who has his eyes fixed firmly on the Presidency (and soon also Mrs Lee). The novel is a wonderful satire on this incestuous and power-obsessed society, headed by the incompetent and ridiculed President and his much-hated First Lady, who Madeleine first sees as ‘two seemingly mechanical figures’, shaking the hands of their visitors as if they were only ‘automata, representatives of the society which streamed past them’. All seek only self-advancement – the men through office, the women through marriage. Victoria Dare, who manages to snare herself an Irish lord, is one of the most conniving of political manipulators, while Madeleine herself is subject to rumours, gossip and harassment in the press, through her association with Ratcliffe. This society is one in which women too are powerful (although this power is dissipated upon marriage) – Madeleine, in a reversal of what you might expect from a novel of the period, regards ‘men as creatures made for women to dispose of’, thinking that they are ‘capable of being transferred like checks, or baggage-labels, from one woman to another, as desired’. The men meanwhile are embroiled in manoeuvres and counter-manoeuvres, in-party fighting, and large-scale bribery to replenish personal and campaign funds. Madeleine’s desire that Ratcliffe and his peers should act in the ‘interests of the people’ is naïve, extraneous to the realities of life in D.C., and, while she frames the choice she must make at the novel’s close in terms of wider principle, her friends and sister are looking out for her best interests likewise. The morality of democracy, Adams suggests, comes back to the morality of the men who participate in it – and not just the power-hungry who find themselves in Washington. “The bitterest part of all this horrid story is that nine out of ten of our countrymen would say I had made a mistake” Madeleine opines. In other words, democracy is wrong. Are there any other nineteenth-century American novels you would like the Secret Victorianist to blog about? Let me know – here, on Facebook, on Google+ or by tweeting @SVictorianist. Labels: America, American, Henry Adams, New York City, Washington D.C.
A couple of posts back I looked at what literary realism is – and why it mattered so much to the Victorians – using George Eliot’s Adam Bede and Middlemarch as illustrative examples. 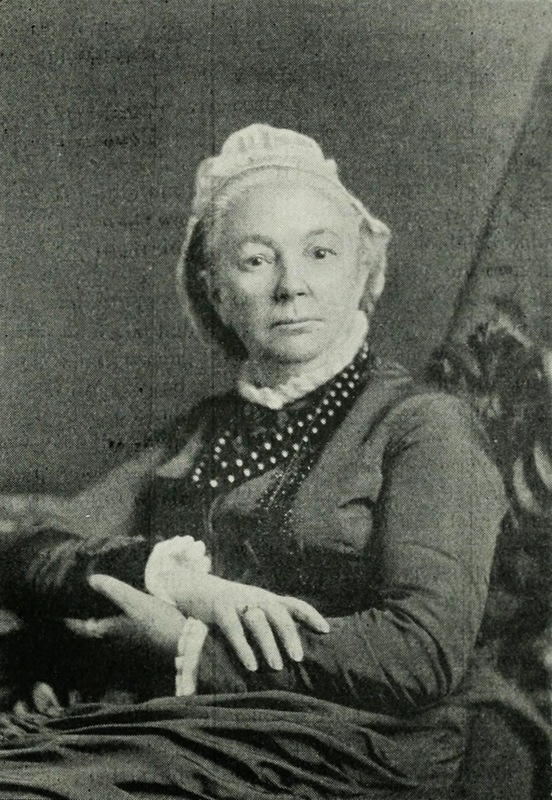 Margaret Oliphant saw her own writing as much inferior to that of the most famous of nineteenth-century realist novelists, claiming that after her death ‘no one will mention me with the same breath as George Eliot’, but having just finished her novel Hester (1873) I think not only was she wrong, but that this novel ought to be considered one of the very finest examples of psychological realism. Hester is like many Victorian heroines – poor and without prospects, but clever and attractive – yet, unlike many Victorian novels, the greatest dilemmas the heroine faces aren’t centred on marriageable men, but her complex relationships with other women. There is Catherine Vernon – a businesswoman who has saved the family’s bank, and continues to support her poor relatives (including Hester). Successful and revered, a local celebrity, Catherine faces old age knowing there are none who truly love her, investing all her emotional health in the ‘son’ she has chosen to succeed her in business. Then there is Hester’s mother, Mrs. John Vernon, who is of high importance in the novel, despite her near-constant blindness to the action unfolding around her. Like presumably many Victorian women, her sense of what it means to be a woman and pursuit of an ideal femininity has kept her in ignorance of many things and helpless in the face of her husband’s reckless endangerment of the family business and her later widowhood. Intimidated by her vibrant daughter, nostalgic for the days she lived in luxury and most at home discussing ball dress design or the preparation of strawberry jam, Mrs. John is the kind of character who is usually subject to contempt or criticism in the world of a novel – but this is not the case. What is extraordinary about the novel is the way in which Oliphant deals with sympathy with all these women, sketching out the inner turmoil of fourteen-year old Hester, brave but thrust suddenly into an unfamiliar social situation, with the corresponding teenage insecurities, sixty-five year old Catherine, called on yet again to be brave and to put aside her own emotional trauma to save the jobs of many men and the money of her own family, and Mrs. John, who years on is just as ignorant as to what the bank clerk meant when he burst into her parlour to saver her from ruin, many years before. A cast of supporting characters get slightly less attention when it comes to their psychology, but they are wrought with believability and satirical humour. The ‘Vernonry’, where Catherine houses her poor relations is a peculiar world of boredom, gossip, resentment and rivalry. The Ashtons (distant relations of Catherine on her mother’s side) represent a different side of business to the noble pursuit of success for common good Vernon’s (the bank) comes to stand for. Roland Ashton, left alone to make his own fortune, plays the stock market to advance himself independently (in contrast to Hester’s cousins, now partners at the bank, Harry and Edward, who Catherine keeps a close eye on). His sister Emma meanwhile pursues her fortune likewise – plotting to marry with a pragmatic view to her prospects, which is an amusing contrast to many Victorian marriage plots. The novel moves steadily towards its climax – the crisis of Hester’s young life – but when the shocks come, they aren’t as a consequence of surprise or revelation, but of Hester’s own realisation of the network she is a part of, the inadmissibility of abandoning her ‘post’, like her father did. Pressed to flee – in other words to act out the kind of sensation novel plot Oliphant so disapproved of – Hester knows that she cannot, observing the duty which comes with relationships, to the mother that she loves, but also to Catherine, for whom she has had so much enmity. In other ways Hester learns the same lesson as a character in Eliot – growing up means becoming a realist, and developing an awareness of the interiority of others. What nineteenth-century novel should the Secret Victorianist review next? Let me know – here, on Facebook, on Google+ or by tweeting @SVictorianist!